In recent years, the electrification of transport has emerged as a trend to support energy efficiency and CO2 emissions reduction targets. Relative to their internal combustion vehicle (ICV) counterparts, electric vehicles (EVs) be they trains or cars, have a greater "well-to-wheel" energy efficiency. They also have the added benefit of not emitting any carbon dioxide in operation and rather shift their emissions to existing local fleet of power generation technology. The true success of electric vehicles depends on their successful integration with the infrastructure systems that support them. From a transportation perspective, electric cars may have only a short range but require many hours to charge. From an electricity perspective, the charging loads can draw excessive power demands which may exceed transformer ratings, cause undesirable line congestion or voltage deviations. These loads may be further exacerbated temporally by similar charging patters driven by similar work and travel lifestyles or geographically by the relative sparsity of charging infrastructure in high demand areas. In effect, the electric vehicles and their supporting charging infrastructure couple the transportation and electrical systems into a nexus. 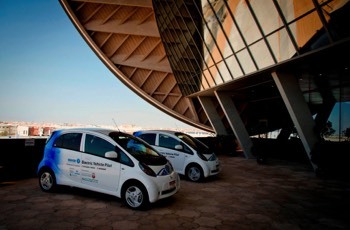 Photo Credit (on right): Photo Credit: Mitsubishi Heavy Industries Electric Vehicle Pilot at Masdar City. 2013. 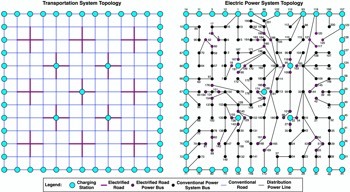 A Hybrid Dynamic System Assessment Methodology for Multi-Modal Transportation Electrification (2017): Leveraging our model of the same name, this work presents the first assessment methodology to integrate transportation system dynamics, charging limitations, and the electric power grid. A Hybrid Dynamic System Model for Multi-Modal Transportation Electrification (2016): Leveraging our expertise in hetero-functional graph theory, this work presents the first model to integrate transportation system dynamics, charging limitations, and the electric power grid. Symmetrica: Test Case for Transportation Electrification Research (2015): One challenge in simulating a transportation electricity nexus is the choice of dataset — particularly when for many cities these infrastructures have not yet been coupled! The Symmetrica Test Case provides an excellent first place to start testing you new simulation platforms. Electrified Transportation System Performance: Conventional vs. Online Electric Vehicles (2016): Building upon our newly developed transportation electricity nexus simulator, this work presents a rigorous techno-economic comparison of the the performance of online and plugin electric vehicles. The studies specifically weighs the investment and operating cost trade-offs. Abu Dhabi Electric Vehicle Integration Study (2016): In the first full scale study of its kind, the LIINES has studied the technical feasibility of electric vehicles into the city of Abu Dhabi with respect to three infrastructure systems: the road transportation system, the electrical grid, and the Abu Dhabi Department of Transportation's Intelligent Transportation System. Additionally, we have written several blog posts specifically on the topic of the Electrification Transportation Systems @ the LIINES.